Located in the famous bridge house, Rajas offers a unique Indian dining experience in contemporary yet modern surroundings. 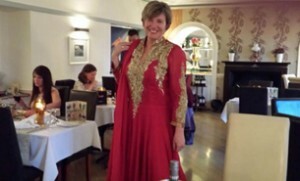 Rajas is a fully licensed restaurant, offering traditional authentic Indian dishes for both vegetarian and non-vegetarians. Rajas also offers an alfresco dining experience during the summer months, eat on our delightful patio area which leads onto wonderfully blossomed gardens.